“continuous period without minimum essential coverage is less than three full calendar months and is the first short coverage gap in the individual’s taxable year” (emphasis mine). So as long as you’ve got coverage for at least one day of a month, you’re considered covered for that month, and that month doesn’t count as part of your gap in ACA compliant coverage. If you have a policy that ends on January 2, and then you remain uninsured for the rest of January, all of February, and all of March, your “short gap” is only considered to be two months, since you had coverage for at least one day in January. But your gap in coverage includes three or more months, you’ll be assessed a penalty for the entire period without health insurance. There’s a general misconception floating around about the short gap exemption – a lot of people think that you can go without coverage for three months and not have to pay a penalty as long as you have coverage by the fourth month. That’s incorrect though; if you are without coverage for three months, you’ll owe a penalty for all three of those months (1/4 of the annual penalty amount, assuming you maintain coverage for the other nine months of the year). But if you have coverage for nine months and are without coverage for three months, you’ll owe a penalty. We’ve discussed this issue with the exchange, and they’re working to update their information. It’s also important to note that the IRS will look back at the prior year if your uninsured period started before January 1. So for example, if you were uninsured in November and December 2014 (but had coverage for the other ten months of 2014), you don’t owe a penalty for 2014, since your gap in coverage was only two months. But if you remained uninsured during January and February 2015 and got coverage effective March 1, you would owe a penalty for 2015. That’s also explained on page 53654 of the IRS penalty regulations. You would only owe a penalty for two months (1/6 of the annual total, assuming you maintain your coverage for the rest of 2015), because the penalty assessment can’t begin earlier than January 1. But for the purpose of counting how many months you were uninsured in order to see if you qualify for a “short coverage gap” exemption, they do look back beyond January 1. Related: What if your coverage gap spans two calendar years? So just to reiterate: a three month gap in ACA coverage is too long, and will result in a penalty when you file your taxes next spring. Last year, the IRS allowed a one-time exemption for people who enrolled by the end of open enrollment (March 31) and got coverage in place by May 1. 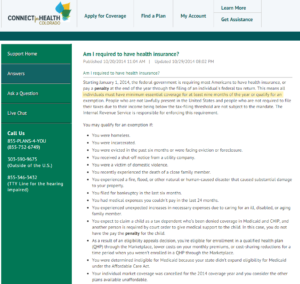 Those enrollees had a four month gap in coverage, but were still exempt from the penalty. But that was for 2014 only, and does not apply this year.